Celestial Cinnamon Bites (Egg-Free) - Low-Carb, So Simple! -- gluten-free, sugar-free recipes with 5 ingredients or less | Low-Carb, So Simple! This time I have given weights of the ingredients in the recipe because at least for me it’s easier to use scale for measuring than measure the stuff by volume. I just put the ingredients one after the other in the bowl which I have placed on a scale, and press the tare button in between. Simple. But if you prefer, I can give the volumes as well. Just leave a comment. So, here is how it goes. Mix and knead the dough by hand for a minute or two until smooth. Form walnut-sized balls and place them on a baking sheet lined with parchment paper. Bake in the preheated oven for some 10 minutes. Try to resist the temptation to touch the cinnamon bites while they are hot or warm! They are extremely fragile. They will get harder and hold well together after cooling down completely. You can dust the ready cinnamon bites lightly with ground cinnamon. Shape the dough into walnut-sized balls and place them on a baking sheet lined with parchment paper. Bake in the preheated oven for approximately 10 minutes, or until the cinnamon bites get a little bit color. Don’t let them get brown! I had done some dairy-free chocolate chip cookie experiments for some while, however I wasn’t completely happy with the result, albeit the cookies were pretty okay. At some point my quota for chocolate chips became full (really, it did), so I decided to try out something else. Since the combination of almond flour and vanilla-flavored whey protein has proven to produce marvelous baked goods, I wanted to give it a try here. In addition to whey protein, I also wanted to use some other dairy product: good old butter. I combined all the ingredients in a bowl and mixed the dough by hand. I formed balls from the dough which I flattened gently with my fingertips as cookies — no bites yet. The resulting cookies were really really nice, I was very surprised about that. Well, because of the excess amount of erythritol they were pretty sweet, but they certainly were tasty and the texture was fine. The yield could have been a bit bigger, now the whole batch swiftly vanished into our mouths. In my second experiment I put by accident 4 oz (115 g) butter in the bowl. Since I wasn’t very willing to remove it, I had to increase the amounts of other ingredients. That needed some calculations. In the end I got more cookies, which was a welcome thing. As a matter of fact, this time I didn’t flatten the balls which I had shaped from the dough, I simply left them the way they were on the baking sheet. They looked so round and beautiful. I wondered how will they look after baking. Last, I fine-tuned the amounts of ingredients so that they are easy to measure by weight. 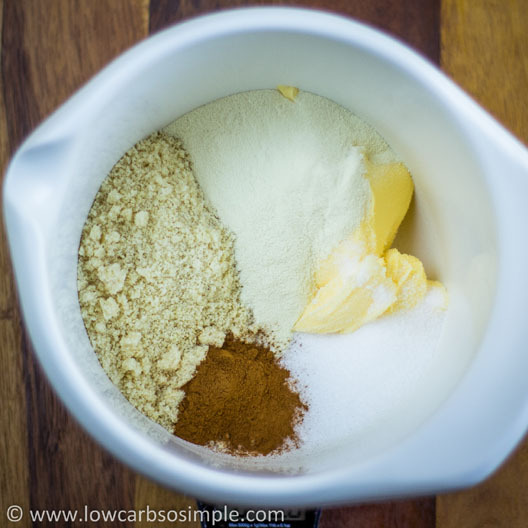 These cinnamon bites are quite sweet, so you might want to reduce the amount of erythritol by a tablespoon or two, depends on your sweet tooth. If your carb plan allows, you can add either 1 oz (30 g) finely chopped organic raisins or 1.5 oz (≈ 45 g) apple juice sweetened dried cherries. You see these variations in the photo below. In fact, I wanted to try out chopped dried cranberries as well. That might be perfect for the Holidays. Like I mentioned in the very beginning, if you are interested in a dairy-free version of this recipe, please follow me on Facebook. UPDATE: Here is the link to the recipe via Pinterest. How much vanilla extract would u use if you didnt have the powder ? Would u have to increase another ingredient to make up for loss of powder? Well, for this recipe, you HAVE to use some kind of protein (preferably whey protein, but rice protein works too, but not that well), however, you can use unflavored whey protein and get the vanilla flavor from 1 teaspoon vanilla extract (naturally depending on the brand that you use). Hope it helps! Thanks. They really are delish !! Hi Barbara, sorry for the late answer. I didn’t get any notifications of new comments and was wondering why nobody is commenting my blog anymore… Anyway, many thanks for your comment. Have you already tried these out? The good thing is, that since these are not flat but rather bites, they should hold better together than flat cookies if you reduce erythritol. Personally, I would try to reduce it by half and see how the bites turn out. Please tell me how you succeed if you try that out! Barbara, thanks for trying out these! Yes, please cut down the sweetness if you feel that they are too sweet. Erythritol helps holding them together, though. I would love to hear how they work with hazelnut meal, I bet they will turn out well! I made a batch tonight and have already had several. I did find them a bit too sweet, so will cut the sweetener down a bit. I think these would be great with hazelnut meal and maybe some chopped hazelnuts, and love your suggestion for the cranberries! these look awesome – and I am metrically challenged without a scale – so is this right for the final resul?? 1 cup (240 ml) almond flour, 1/3 cup (80 ml) vanilla-flavored whey protein, 6 tablespoons (85 g) unsalted organic butter, 1/3 cup (80 ml) erythritol crystals and 2 teaspoon ground cinnamon ??? ps I love that you talk about the processes before your end result. Hope you like these if you try these out! I wish I could pin this recipe on Pinterest. Hi, you should be able to pin it when you hover on the photo. It gives you possibility to share it on Facebook, pin it or tweet. Alternatively, on the very left side there is a bar where you can pin it (currently there are 1.4k pins). You can see also other symbols (Facebook, Twitter, Google+, email) in that vertical bar. Hope this helps! Hi I tried making these and followed the recipie but when they came out, they were no longer round but flat and it looked like some of he butter melted out on the cookie sheet. Where did I go wrong? Hi Karen, I’m sorry to hear that the result wasn’t what you were expecting. I really wonder what could have went wrong since I’ve never faced that kind of problem. Did you use the exact ingredients mentioned in the recipe? Sometimes different brands behave in a different way. For me it sounds that there was too much butter or too little dry ingredients. Was the almond flour Bob’s Red Mill, or something similar (I mean not extremely fine and not really coarse but something in between)? I would love to help you, could you give me more detailed info about the ingredients and amounts you used, like brands, etc.? Or was everything exactly according the instructions? I made these cookies this past weekend. They are wonderful! I have been craving a cookie since I began my low carb journey in November and this cookie fit the bill and I am now satisfied. I made some small modifications. I added 1/8 teaspoon salt to round out the flavor, I cut the erythroil in half, I replaced the butter with coconut oil and I flattened them into a round disk. They came out great. I keep them in the freezer for a cool warm weather dessert. Thank you so much for your innovative, tasty ideas. This is the third of your recipes I have used with great success (blueberry muffins, rye bread, and now these cookies). Hi Christie! Thank you for your comment! Your modifications sound very good! I sometimes have a problem that the cookies don’t hold well together if I reduce the amount of erythritol, but it seems that your cookies were holding well together. Great to hear that you have liked my other recipes as well! I don’t have a FB account. How can I get the dairy-free version of these cinnamon bites? 1. Preheat the oven to 350 °F (175 °C). 2. Place all ingredients in a large bowl. 3. Mix and knead the dough by hand for a minute or two until smooth. 4. Shape the dough into walnut-sized balls and place them on a baking sheet lined with parchment paper. 5. Bake in the preheated oven for 8–10 minutes, or until the cinnamon bites get a little bit color. Don’t let them get too brown! 7. Store in a cool and dry place. Yield: Approximately 2 dozen bites. One bite contains 2.7 g protein, 5.9 g fat, 0.7 carbs and 67 kcal. Btw, these bites are crunchier than those in the blog post above. Thanks so much for the dairy-free version. Can’t wait to try them. You’re welcome 🙂 Hope you like them! I love this recipe for its simplicity. However, I messed it up somehow. I doubled the recipe and had to substitute Splenda for the erythritol, which I did 1:1. The bites came out very crumbly and powdery with no crispness. They tasted good but had a bad texture. It seemed like it was missing a binder. Is it because I used Splenda? Hi Kate, thanks for trying out my recipe. I’m sorry to hear that the cookies didn’t turn like you wished. I think that the crumbliness must be because of Splenda. Erythritol somehow seems to work as binder in these egg-free recipes. If you use Splenda, I wonder if adding an egg (or two if you double the recipe) would help, usually it does. You might want to add one egg at a time to see that the dough doesn’t become too runny. Hope this helps! These look great. Was wondering if I could use coconut oil instead of butter. Thanks, Lesley! I haven’t tried these with coconut oil but with 2.5 oz (70 g) vegetable shortening. Usually if you replace butter with coconut oil in a recipe, you need less coconut oil. I don’t know why. I suggest you start with 2 oz (60 grams) coconut oil and add more if the dough is too crumbly and doesn’t hold together. What do you think? Thank you so much for this wonderful recipe! I found your site last night when I wanted to make almond flour crackers but realized my go-to recipe wouldn’t work as I was out of eggs. Found your sour cream and chive cracker recipe, and they turned out great. I also noticed this one, so I decided to have a sweet treat this afternoon. I only had chocolate protein powder on hand, but the flavor is great. One question – I noticed the cooling effect of the erythritol is quite pronounced in this quantity. Have you explored using stevia – either powdered or liquid – in this recipe? I really love the texture – melt in your mouth and delicious! I will be back to your site again and again for low carb, natural recipes. Thank you! Thank you for trying out my recipes! I’m so glad that you like them. I haven’t tried to replace part of the erythritol with stevia in this recipe, but I would expect that works. It worked also in my Vanilla Toffee Butter Cookies. However, I cannot say how that would affect the texture… Could be that the amounts of all ingredients need some adjusting. But basically it should work. Please tell me how it works if you try it out! Hi. These look delicious, but I don’t have a scale. Could you provide the volume measuremenrs? Thanks! Thank you! These look simple and yummy! And easy to adapt to different ingredients. For starters, I am going to add some powdered cloves! Jan, you’re welcome! Would be great to hear how you like them and what kind of adaptations you made! I think these will be great with all kinds of spices. During the holiday season I’m going to try out some gingerbread spices… Maybe lemon flavor would be convenient during the springtime?